When searching for the cause of lameness in a horse, a veterinarian follows a methodical lameness exam protocol. Knowing a bit about how that exam is conducted is important to understanding the ultimate lameness diagnosis and being an active partner in making your horse sound once again. 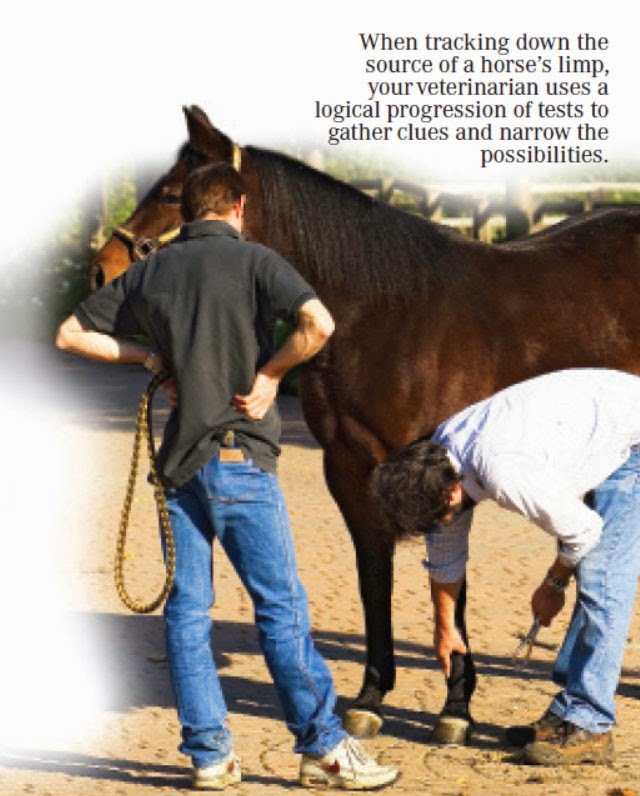 In this article from EQUUS Magazine available as a printable download to keep at the barn for reference equine veterinarian Melinda Freckleton, DVM, explains her lameness exam protocol and discusses some of the questions and challenges owners will face as they tackle their horse's lameness issues. When I arrive on a farm to investigate a lameness case, I often wish I had a Star Trek-like scanner that I could wave over a horse to get a readout showing the exact location of the problem. Of course, diagnostic technology hasn’t advanced quite that far. 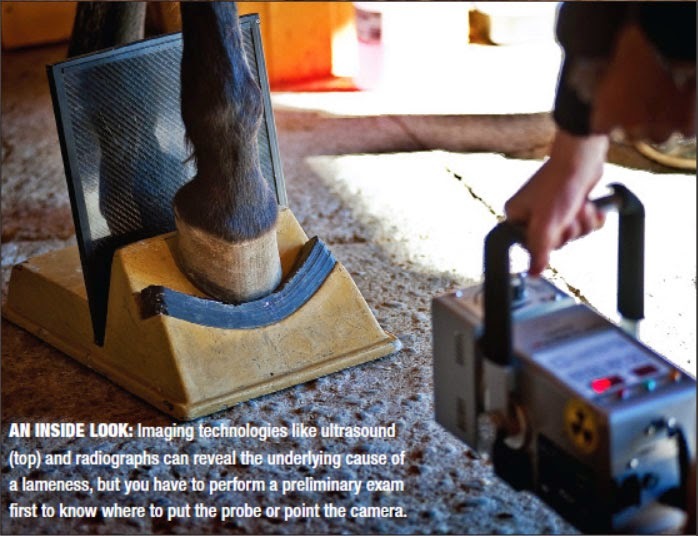 But over the past two decades, examination protocols have advanced enough to take much of the guesswork out of diagnosing lameness. So I don’t have a magic scanner, but I do have a logical progression of tests designed to reveal where lameness originates and, in many cases, what is causing it. All veterinarians learn the basic lameness exam format in veterinary school, and we then customize that process over time based on our own experiences and preferences. To my clients, I’m sure it sometimes looks like I am just randomly picking legs to prod or jogging a horse back and forth while I think of something else to do. But each exam follows a specific process developed to increase the chance of revealing useful information. 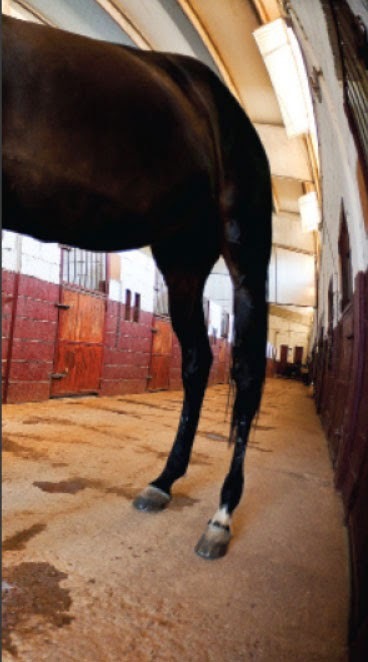 Your veterinarian, no doubt, has his or her own specific approach to lameness examinations. 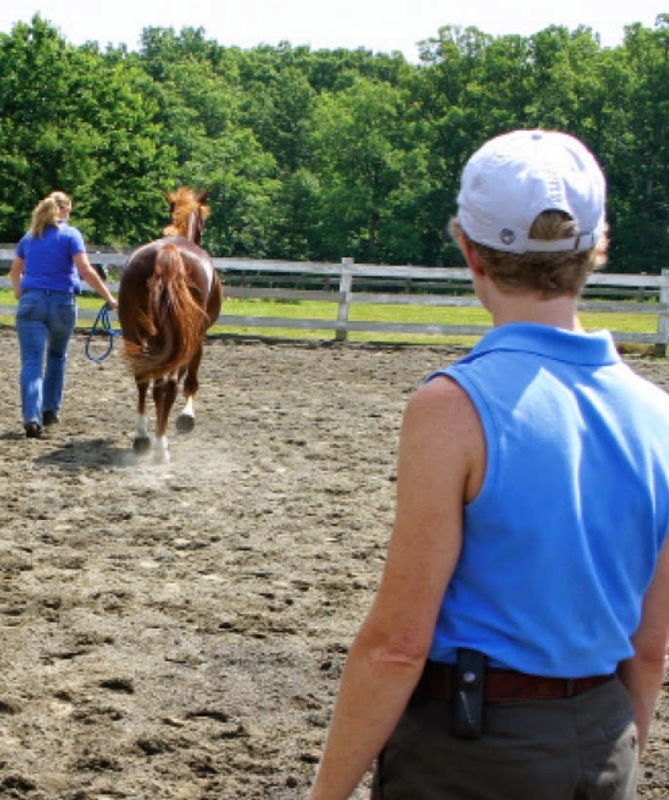 But by showing you how I conduct mine, I hope to help you become a better partner in determining where your horse is hurting and what can be done about it. The easiest lameness exams, from a diagnostic standpoint, are those that involve a dramatic limp or even a hoof held off the ground. In these cases, even a non-horsy spouse can pick out which leg hurts---the horse couldn’t make it any clearer. I generally will not ask a horse in this shape to walk, even a single step. Making him move will not only cause unnecessary discomfort, it could make a minor problem much worse---a hairline fracture can become a full break, for example. Instead, I’ll have the horse stand still as I look the leg over and run my hand over the tendons and joints. A horse who is so obviously lame may have a massive cut, broken bone or damage to a vital structure. If I find anything like that, the visit is no longer a lameness exam, it’s an emergency, and my priority will be to stabilize the limb while we decide how to proceed. Thankfully, I usually don’t find anything that dramatic on the leg or body, so I turn my attention to the hoof. In a large portion of the country, including where I practice in Virginia, a horse who goes horribly lame in a single limb without any other sign of injury usually has a hoof abscess. I’d even put it as high as 90 percent of these types of exams lead to the diagnosis of a hoof abscess. It’s a fairly easy call to make: First, I’ll use a hoof tester to try to pinpoint the exact location of the pain. Similar to a large pliers, a hoof tester is used to compress specific areas of the hoof. Squeeze hard enough and any horse will flinch, but if he pulls away from pressure that just a few inches away didn’t even register, you’ve found the trouble spot. I’ll methodically work around the hoof wall, across the sole and the edges of the frog to test all the possible locations. When I’ve located the area of pain, I may use a farrier’s knife to pare away a bit of sole and look for an abscess. If it’s shallow, the pus will drain right then and there, to the relief of the owner and the horse. So, if we’re all lucky, I can diagnose a hoof abscess, begin the treatment process and be off the farm in a half-hour. But we’re not always that lucky. If the hurt leg isn’t obvious when the horse is standing still, the next step is to watch him move. Some types of lameness can be seen when the horse is simply walking in a straight line, but many times a horse must be jogged and viewed from many angles and as he turns to make a determination. I usually have an assistant on hand to jog a horse for a lameness exam. Not IN A PINCH: I use hoof testers to pinpoint painful areas on the hoof. These are particularly helpful in diagnosing hoof abscesses, which are common in my practice area. OUT AND BACK: As the horse jogs, I look for gait irregularities as well as the telltale head bob of lameness. Not only does this spare an owner from having to run back and forth for several minutes, but it allows her to observe what I see, at the time I see it. This makes it easier to explain what it all might mean. My assistant will first walk and then jog the horse in a straight line away from me over a relatively firm surface ---a driveway works well. I’ll then watch the horse head back toward me and, if necessary, move to one side so I can watch him walk and trot across my line of vision. It’s important that the horse be allowed to move freely, so my assistant will jog him on a loose lead, not dragging him behind her. Initially, I try to look at the whole horse to get the big picture, but one of the first things I focus on is head movement. When a horse puts weight on a sore limb, he’ll lift his head to relieve the pressure quickly. That’s what creates the distinct head bob of lameness: A horse lowers his head when his good limb is on the ground and raises it when the “bad” limb bears weight. When the lameness is in a forelimb, this bobbing may be paired with an obvious favoring of a leg. When it’s a hind limb, detection can be trickier, but I’ll watch for one hip carried higher than the other or a hind foot that is not brought as far forward as the other. Additional clues include how far each fetlock drops as the leg bears weight and the sound of the hooves striking the ground, which can tell me which leg is getting more or less weight as the horse moves. Some types of lameness become apparent only when a horse turns, heads off or moves in some other specific way. I may have the horse longed in different-size circles or trotted up and down a small hill to get a better look at a subtle gait abnormality. I’ll also rely on the owner to tell me where and when she’s noticed the lameness so we can attempt to re-create the conditions where it is apparent. This is a bit like taking a clunking car to a mechanic: If it doesn’t make the noise when it’s at the shop, there’s little that can be done diagnostically. Some lamenesses are obvious only when a horse is under saddle. I’ll usually hear from the owner that “he looked perfectly fine until I got on him.” In these cases, I’ll still have the horses jogged in-hand to see if I can detect what the rider feels under saddle, but I’ll occasionally end up also asking that the horse be ridden while I watch. Sometimes bearing the rider’s weight will intensify the problem to the point where we can isolate which limb is involved, but not always. There are lamenesses, most often found in elite competition horses, that only riders can feel, and they are understandably very difficult to unravel. Once I’m confident I’ve narrowed the problem to a particular leg, I’ll inspect it and go over it with my hands for any sign of trouble I may have overlooked initially. I’ll also compare it to the opposite leg to look for dramatic differences. Even if it seems certain that the problem is somewhere else, I will put hoof testers on the feet. The foot is the most common source of lameness, and there can be more than one area of discomfort. It’s helpful if I have had an ongoing relationship with the horse, so I’ll probably know whether the swelling on his fetlock is an old windpuff or something more recent and sinister. If I don’t have a history with the horse, I’ll have to ask the owner and hope she recalls. If the source of the problem is still elusive, I move on to the flexion test, a time-honored and relatively easy method for pinpointing lameness. For this test, the veterinarian forcibly bends a joint for about 30 to 90 seconds, then has the horse immediately trot off. The flexing stretches the joint tissues, causing pressure to build up and temporarily intensifying any soreness. If, for instance, a horse seems slightly off on his right fore when jogging out but then is dramatically lame after his right front fetlock is flexed, that may narrow the investigation down to that joint. The results of a flexion test, however, have to be considered carefully. Horses have varying levels of sensitivity to the test. An otherwise sound 20-year-old lesson horse, for example, might hobble off after I flex any joint simply because he’s got more miles on him and a bit of arthritis in every joint. In contrast, a tough-as-nails Appaloosa might not even flinch, no matter how hard and how long a sore joint is flexed. For that reason, many veterinarians will flex the corresponding joint on the “good” leg before flexing the suspect one on the bad leg. This lets us know how the horse normally reacts to flexion so we can keep his reactions in context. I’ve had many owners tactfully point out to me that I’m flexing the wrong leg before I can explain this to them. If I get a “positive” flexion in a joint, I can do several things with that information. We could then take radiographs or do an ultrasound examination of that joint to gather even more information. Or, if the flexion test confirms a strong suspicion, we may stop the lameness exam, make a preliminary diagnosis based on the information we have and begin to outline a treatment strategy. Sometimes, however, the flexion tests don’t pinpoint the problem as I’d hoped. In these situations, there’s another diagnostic technique veterinarians can turn to: blocking, the injection of a small amount of anesthetic directly into nerves, just under the skin, in strategic locations of the leg. Most sites require two injections; some a few more. The limb will become temporarily numb from the site of the injection down to the ground, so we begin numbing from the bottom up until the horse jogs off sound. If, for instance, I numb the hoof and the horse is still lame, I numb the pastern area. If the horse is still lame, I move up to the fetlock. 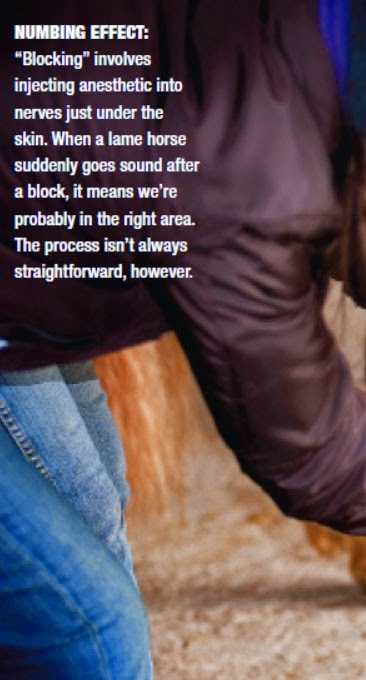 If the horse suddenly goes sound, we can be pretty sure there’s something in the fetlock area causing the problem. Sometimes, if I’ve got a strong suspicion about a particular joint, I may skip ahead and numb a higher joint first. This saves everyone time and the owner money but comes with the risk of confusing results. Nerve blocks also can help uncover multiple limb lamenesses. I’ve had this happen to me more than once: I block the obviously lame leg, only to have the horse suddenly come up lame in what I thought was the “good” leg. This means the horse was sore in both, but we were only noticing the worse one. This happens quite a bit in horses who are “footsore” in multiple hooves, and it is very useful information to have. Nerve blocks are typically limited to below the knee and the hock. You can do them on higher nerves, but it gets tricky to access them and interpret what you’re seeing. 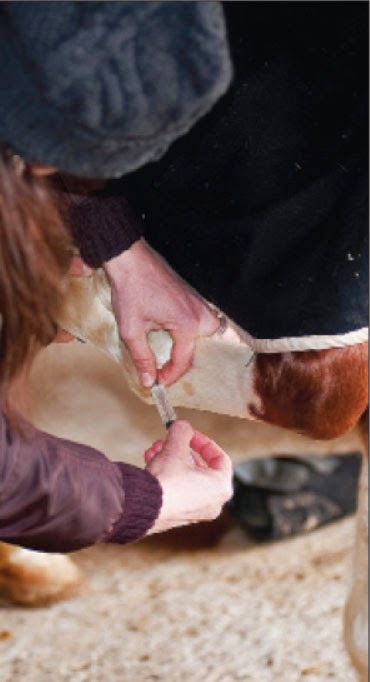 Whether your regular veterinarian uses a nerve block higher in the limb depends on her experience and comfort level with the procedure and lameness exams in general. We are explaining this procedure in a simple way, but as with all things having to do with horses, there are exceptions and details that can make the process more complicated than it seems at first. If I’ve just spent an hour watching a horse trot, flexing each joint and blocking half a dozen areas, and still nothing on his body says “Pick me, pick me!” I stop and discuss a few options with the owner. One is to focus on the problem most likely to be causing the lameness and start treating it. We won’t be guessing blindly, though. We’ll use the evidence we’ve gathered during the exam, combined with what we know about how this horse has been used recently as well as his lameness history. This approach is an excellent choice if your budget is limited, your horse doesn’t “have” to be sound immediately, or resources for a more in-depth investigation simply aren’t available in the immediate area. Ideally, we’d have a definitive diagnosis for every lameness problem before we begin treatment, but that’s not always possible. Thankfully, rest and anti-inflammatory medications are the proper treatment for most minor---and even some major---lameness issues, so going that route is likely to help in most cases. The other option is to refer the horse to a large clinic or university facility that has more state-of-the-art diagnostic imaging equipment. Many field practitioners today have digital radiograph machines and ultrasound equipment, but you’ve got to know where to point them or you’re in for a very long and potentially expensive exploratory mission. And even when you have an idea where to look, some of the portable radiography and ultrasound machines aren’t as powerful as the ones found at clinics. Images in the field may come up “clean,” but images of the exact same area taken with newer equipment might reveal the problem, making the referral worthwhile. Often the team of board-certified experts at the clinic will see problems your regular veterinarian could not due to the combination of their specialized training and experience, their equipment and facilities and---sometimes---because the horse simply looks different on a different day. Comparisons of images taken over the course of weeks or months can also help with some diagnoses. In addition, larger clinics will have the capability to perform lameness diagnostics that just aren’t possible on the farm. Nuclearscintigraphy, also known as a “bone scan,” is an imaging process in which a horse is injected with a radioisotope that naturally collects at areas of active bone metabolism, such as an injury site. Specialized cameras are then used to detect areas of increased uptake, which can help direct other diagnostic efforts. Scintigraphy can detect bone problems in the upper limb, pelvis and back, which are extremely difficult to radiograph, and can detect multiple problem sites during the same test. You run the risk of a spot that doesn’t hurt the horse coming up “hot” because of natural bone remodeling, but you can typically sort through those false alarms. All in all, it’s an extremely useful tool and a relatively easy test. Magnetic resonance imaging (MRI) is another diagnostic tool available only at large clinics. MRI uses radiofrequency pulses and strong magnetic fields to produce incredibly detailed images of “slices” of the horse that show both bone and soft tissues. It’s amazing technology, but with some limitations. The horse has to be anesthetized for most MRIs, although there are some “standing” machines in a handful of clinics. Also, veterinarians are still learning to interpret MRI images to determine if what we are seeing is normal. And, last but not least as far as owners are concerned, MRIs can be very expensive, so you’ll need to have narrowed your search down to a specific limb or area before you start. There’s a wave of research leading to all types of computerized systems that analyze how a horse is moving to detect lameness. One, aptly called the Lameness Locator, utilizes sensors and gyroscopes to track the movement of a horse’s head and hindquarters. The collected data are then presented as charts and graphs that can be interpreted by the veterinarian to determine which leg is lame. While these developments are certainly exciting, we aren’t at the Star Trek scanner phase quite yet: A computer can pick up subtle differences in movements the human eye can’t, but it’s still up to a veterinarian to investigate why a limb is moving differently than the rest. When you arrive at a referral clinic for a lameness exam, don’t be surprised when the consulting veterinarian starts back at square one, watching the horse jog. It’s not that they don’t trust the information provided by the initial veterinarian, but lameness exams really are “big picture” events, and it’s important for each veterinarian involved to see everything. They’ll bring out the big diagnostic guns soon enough, but they may also see something new on the preliminary exam that solves the mystery and saves everyone a lot of time and you a lot of money. Lameness exams are an attempt to impose logic and order on what can be a very messy, complicated problem. Sometimes this works well, and a veterinarian can unravel tangled and overlapping signs to quickly get a clear picture of why a horse is limping. In other cases, however, the exam becomes a test of the veterinarian’s experience and instincts as well as the patience of everyone involved. Even so, it is still our very best tool for keeping horses sound and one that all horse owners benefit from understanding.